Winter and the ensuing cold months ahead, are a great time to go to your local market or as in my case, the Union Square Farmers Market, and pick up some amazing vegetables. These little jewels known as rainbow carrots, are hardy and delicious on their own, with little to fanfare. ( A little rosemary, thyme, salt and pepper). With little time and thought, you can whip these into just about anything you can think of or imagine. I’ve had these for a couple of weeks in the refrigerator and decided that now is the time to make and utilized these beauties in a soup. They were originally meant to be roasted during Thanks Giving meal, but I never got around to making these, as I ran out of time and oven space. So here I am on a Friday night, at approximately 1 in the morning, telling the story of how the little carrots never got did! Well they got did tonight, and will be finished off in a soup. Provided I can stop eating them before tomorrow. These things are so so sweet with just a pinch of salt, they are almost like a dessert. Wash off the carrots of any debris and shake off any excess water or dry in sink or colander. Peel any carrots if they are too thick or discolored or damaged. Place them onto a roasting tray and coat them with olive oil and kosher salt and fresh cracked pepper. Place a few sprigs of fresh thyme and rosemary over the carrots. Preheat your oven for at least 10 minutes before placing the carrots in. Roast them for about 25-30 minutes till tender. Some carrots will be large than others, and can be removed sooner if done to prevent over cooking and to keep them from falling apart. These can be served hot or allowed to cool on the counter tented with aluminum foil or can even be used the very next day if kept in the refrigerator and warmed up in the oven. I will be using mine in a roasted rainbow carrot soup. Enjoy! So after a good long work out which takes me to almost 10:30 pm tonight, I decide on dinner. But the entire time I’m working out I can’t seem to get my mind off of food. I know I have these amazing red beans at home, but I need some kind of animal protein to compliment them. So I take a ride on my bike after my work out to the local Food Town and what should I see in the poultry section?! But these gorgeous little game hens or cornish hens as they are called. And the price was unbeatable at just under 5 dollars. I had solved my dilemma and knew just what I would be having for dinner tonight. And boy was it good. Remove hen from packaging and remove giblets. Rinse the cavity of the hen and pat dry with paper towel. Allow to rest and temper for at least 20-30 minutes. Preheat your oven to 400 degrees Fahrenheit. On a poultry board or counter top or plate, season the cavity of the hen with kosher salt and fresh cracked pepper. Place the lemon wedges, 1 to 2 sprigs of thyme, into the cavity along with 2 garlic cloves that have been mashed with the side of a chefs knife, but do not remove paper. Season the body of the hen with kosher salt and fresh cracked pepper, and just a bit of garlic powder (optional). Truss the hen with the butchers twine. Heat a 10 inch skillet with 2 tbs of EVOO, or canoloa oil. 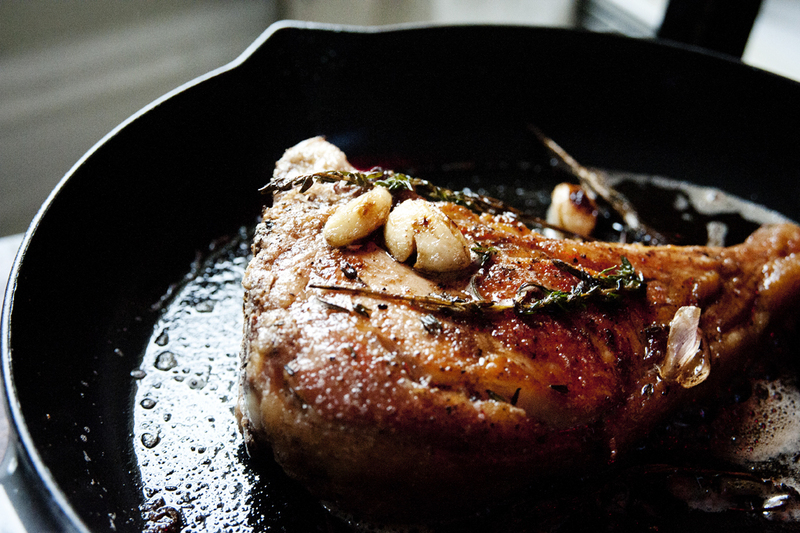 Place the hen into the skillet to brown and caramelize the skin. Brown evenly all sides: from the breast, back and sides. 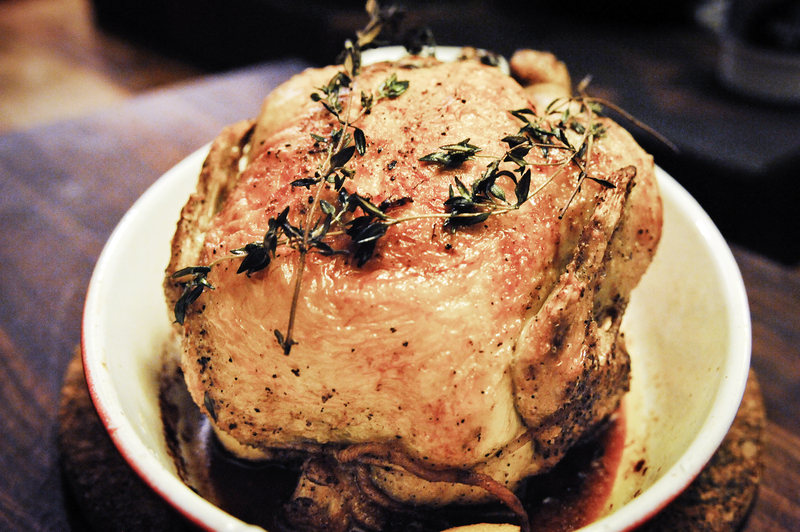 Place a roasting pan or small gratin dish into the oven to preheat while you are browning the hen. 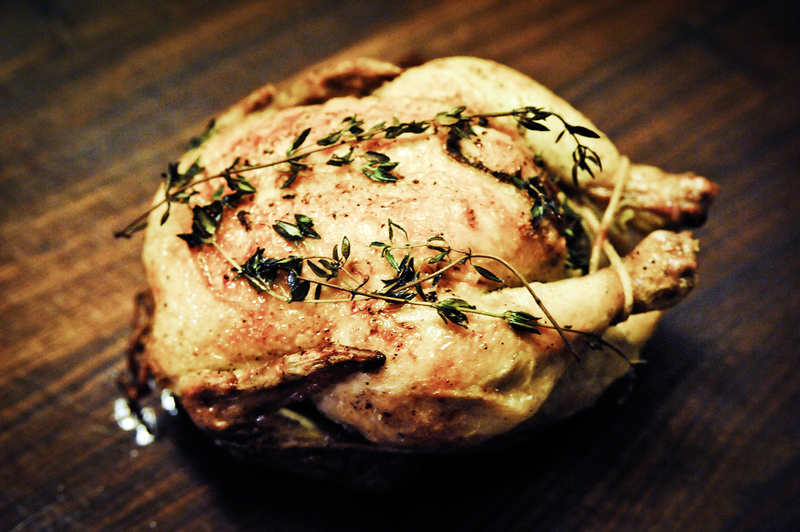 Once browned (slightly) place the hen into the oven to finish cooking (roasting). Browning is of course optional, but a good idea as the bird is small and can over roast if left too long in the oven and also a good way of creating a crispy skin, before roasting. Drizzle a bit of olive oil over the breast and a couple of sprigs of thyme, before placing into the oven to roast. Roast at 400 degrees Fahrenheit for 20-30 minutes. You want an temperature of 165 degrees Fahrenheit taken or read with a meat thermometer at the thickest part of the thigh. The juices should run clear when the thermometer is removed. 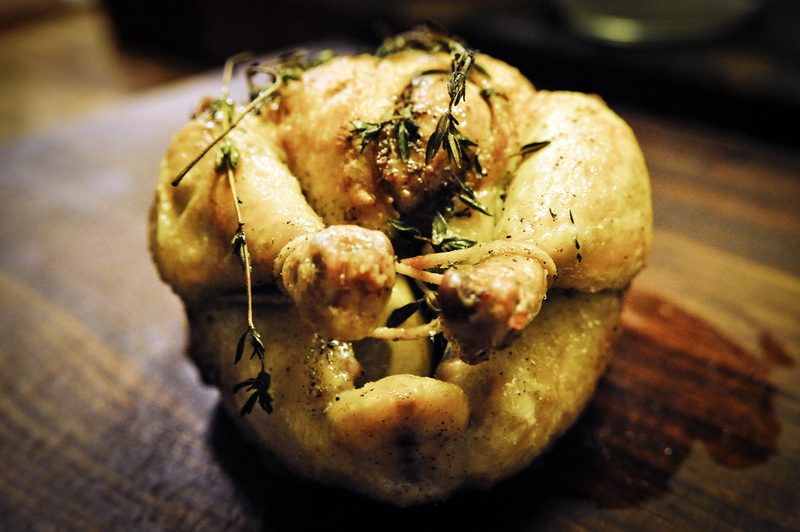 Remove from the roasting dish and allow to rest for at least 15 minutes before carving or serving. Enjoy! Ah filet mignon, one of the most amazing cuts of meat you will probably ever have, if you’re a meat lover like I am and passionate about great cuts of meat too. I love a great piece of meat like most men I know and even some women. These days though, there are many health conscious or veganist minded eaters that will not dare to include the word meat in their lexicon and even less their diet. I however, can’t go a week or even a couple of days without some kind of animal protein sadly. What can I say, it’s how I was brought up, and what I like: don’t knock me for it! 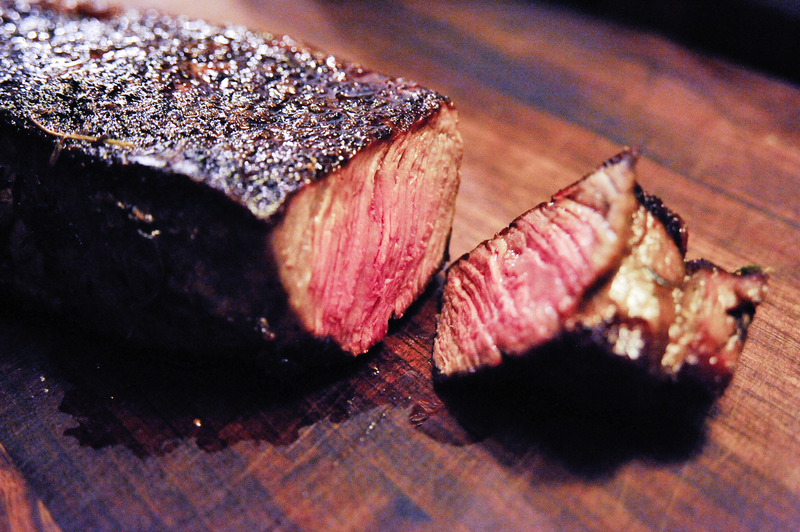 So getting back, when it comes to beef, there are few cuts that can rival a great filet mignon. But lets face it, few of us can really afford to purchase a great steak now a days. 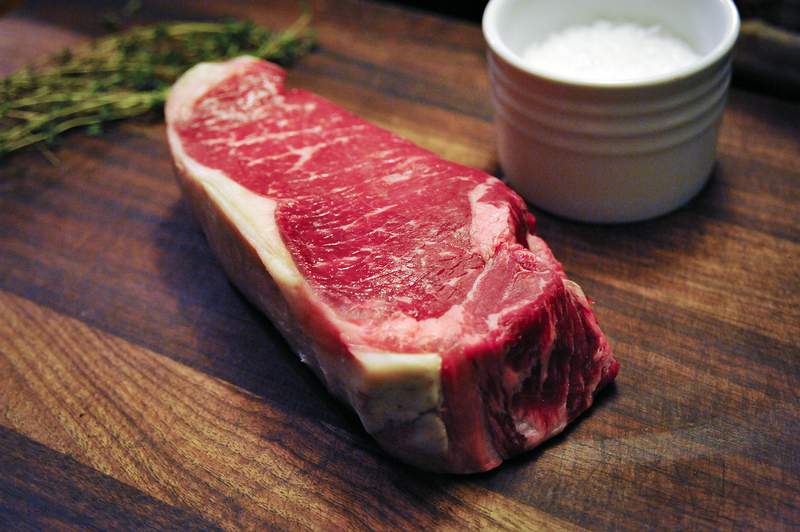 So preparing a great steak like one of my all time favorites, the NY strip or a filet mignon, is a real treat and one must take great care not to screw it up. It’s not difficult but care is the caveat. Well I have to say that this meal was amazing, especially given the fact that I usually go the whole day at work without eating. So it is so worth it for me to prepare a great meal, though late for most. It’s simple things like this dish that make cooking so much fun and worth while. It was an easy dish by virtue of simple but yet, great ingredients, always a plus and the flavors were spot on. That’s what I love about food. 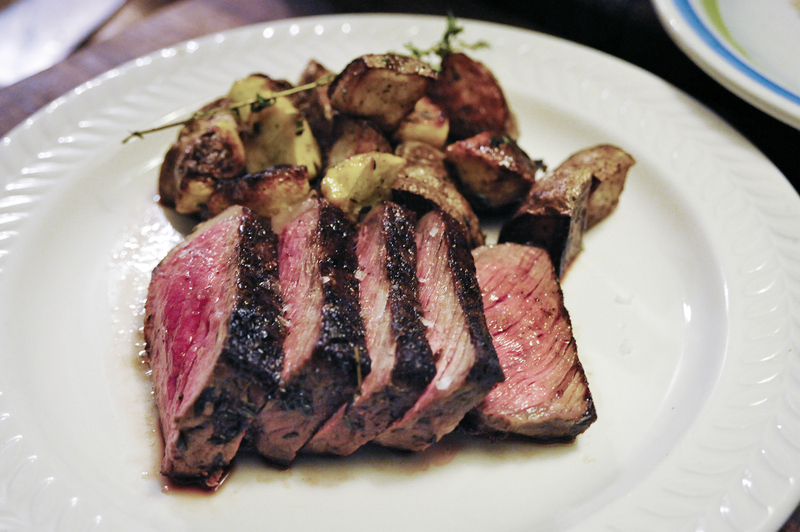 The simpler the better with none of the hype and hoopla associated with restaurant food. The experience can be what I like to call, gestalt! This is how it should be. 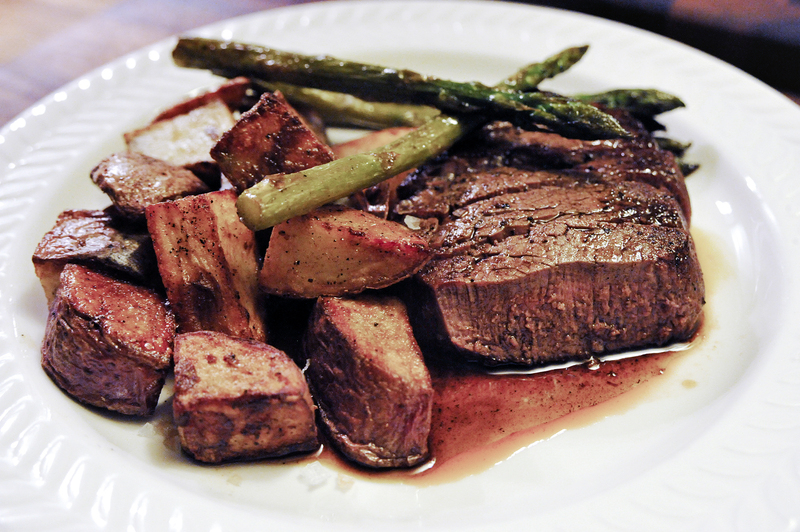 Remove your filet from the fridge and allow to temper (rest) before prepping and cooking, for at least 30 minutes. You can truss with butchers twine by looping twice around and tying a knot. Cut off any remaining string. Season well with kosher salt and fresh cracked pepper. Drizzle a small amount of olive oil on the filet and pat the oil into the filet to cause the seasoning to adhere the the meat. 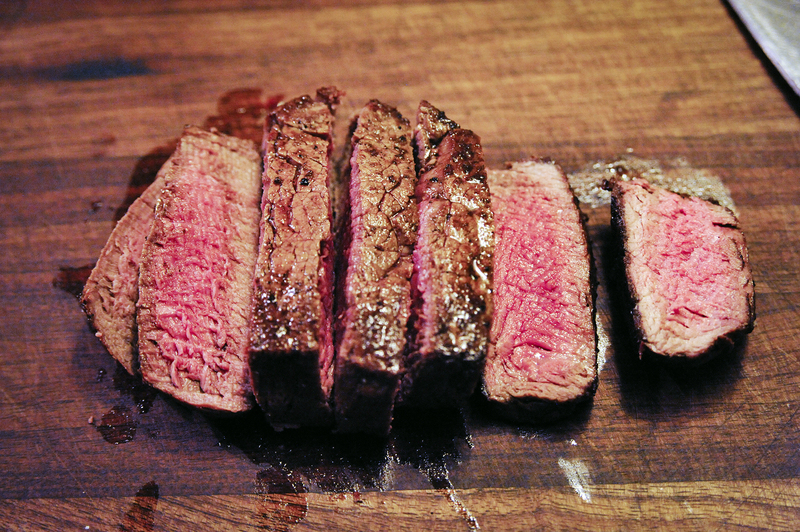 Mop up any seasoning from the plate with the filet by rolling the edge of the filet and even the top and bottom. Waste nothing! 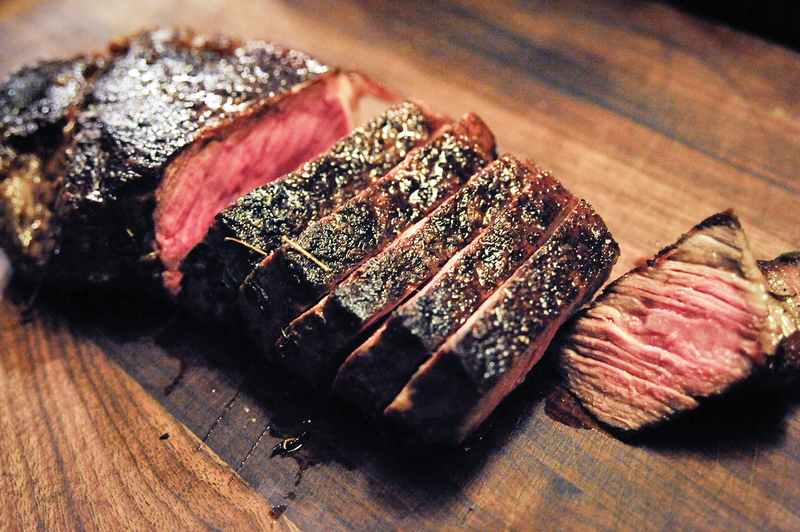 Heat up your oven to 400 degrees for about 12 minutes before searing your meat. 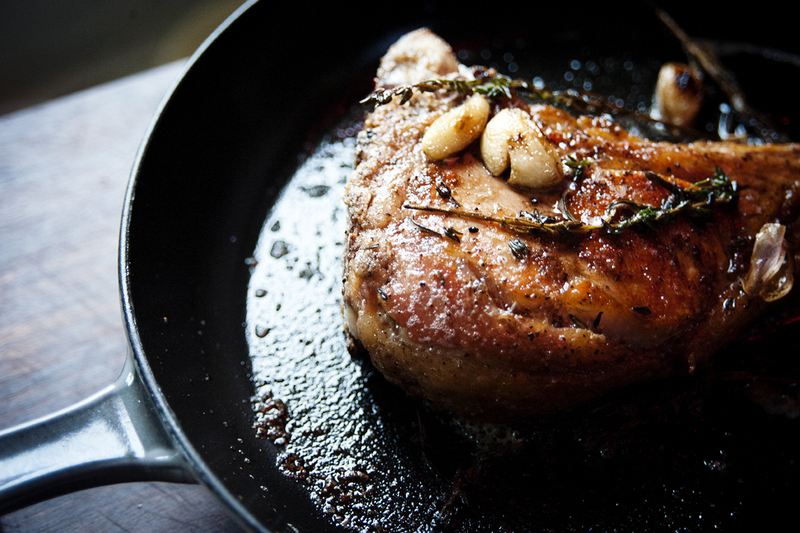 Once heated, place your skillet on the stove over high heat and drizzle 1 tbs of olive oil into the pan. 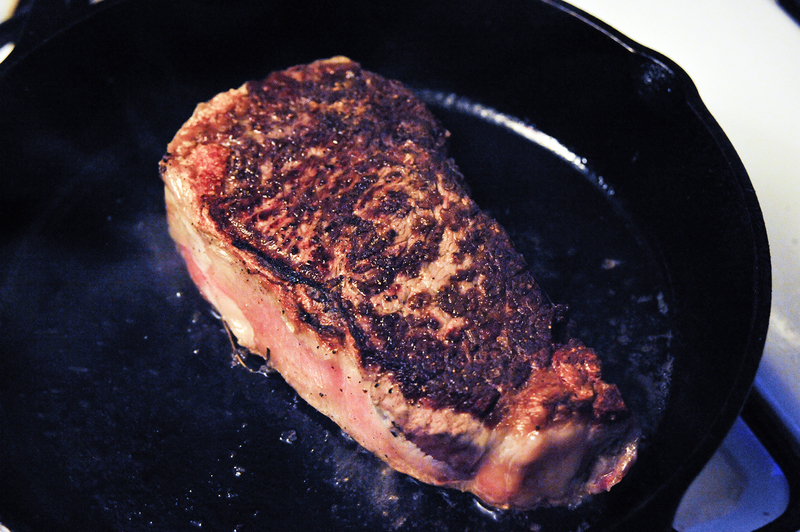 Place your filet in the skillet and allow to sear well before moving, about 2 minutes. 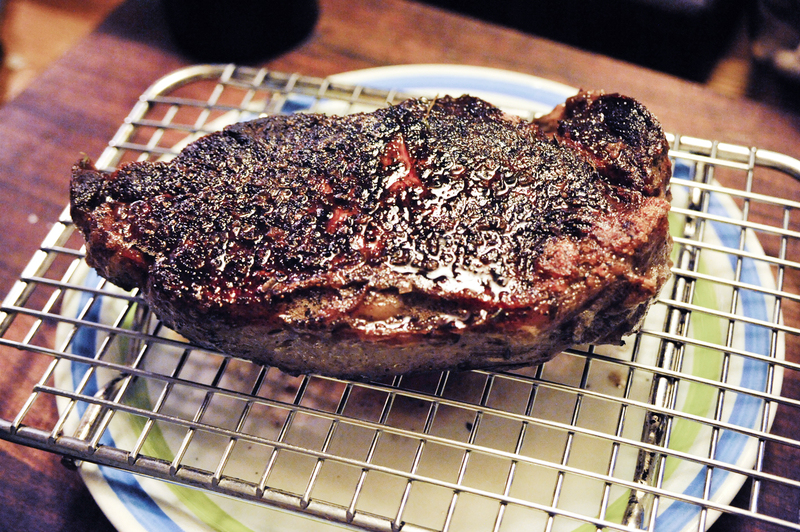 (Do not move the filet while searing or you will break the sear and crust). Repeat by holding the filet with a pair of tongs and searing the edges all the way round the filet. Once done, sear the bottom of the filet for another 2 minutes. 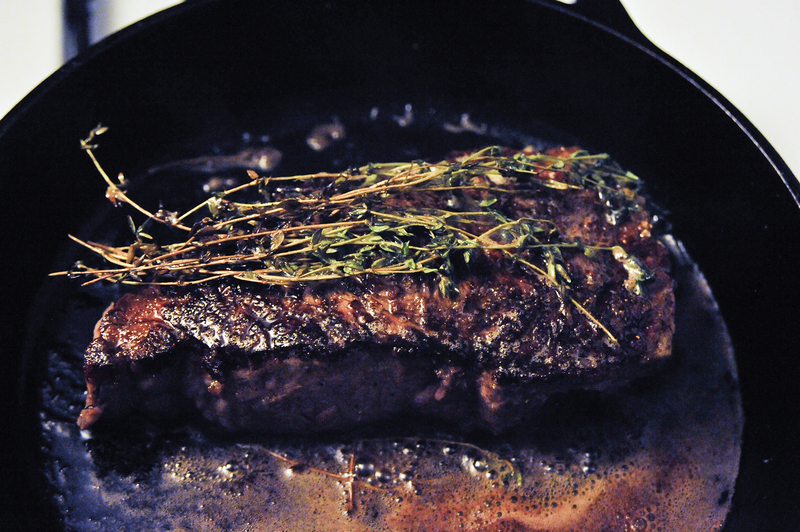 Add the butter and thyme, and tilt your pan toward you and with a large table spoon, baste the filet with the butter and thyme, for about 45 seconds. Place the pan into the hot oven, and roast for 6-7 minutes. Baste one more time before removing from the oven. 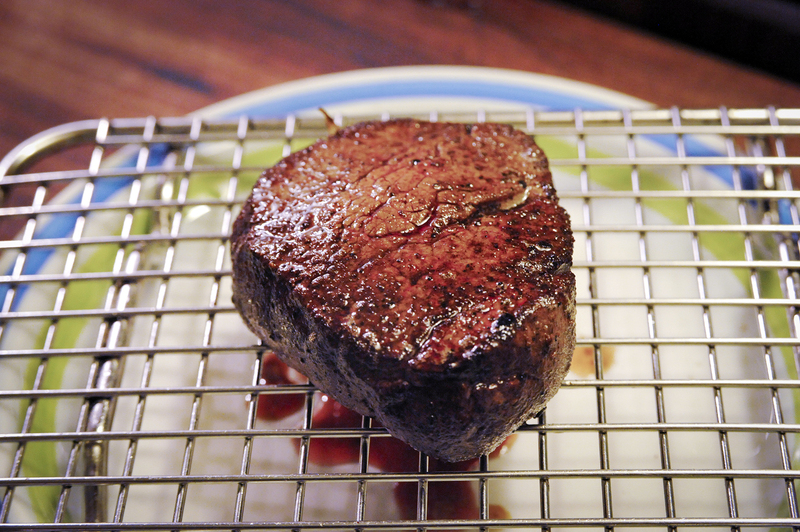 Remove the filet from the pan and place on a small cooling rack or plate and allow to rest for at least 10 minutes before slicing. 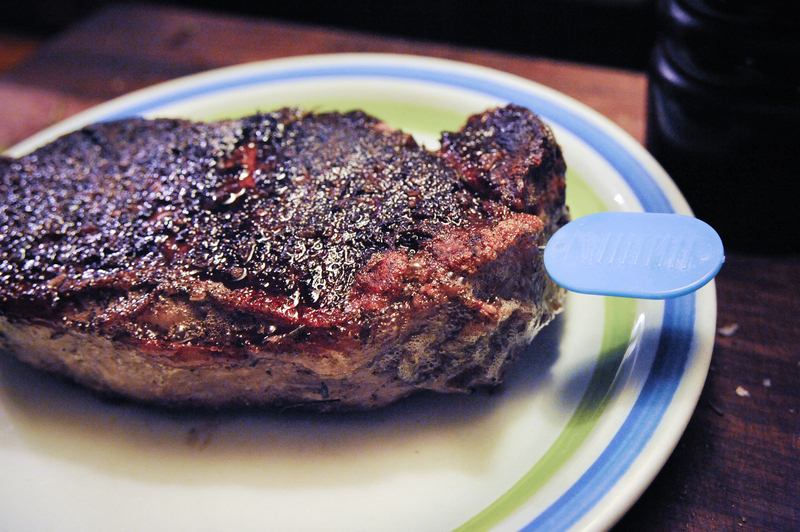 Do not slice or cut or poke the filet with a knife or it will bleed and dry out. Trust me! Allow it to rest. You will thank me later. Slice into 1/2 inch slices and serve with roasted vegetables or potatoes. 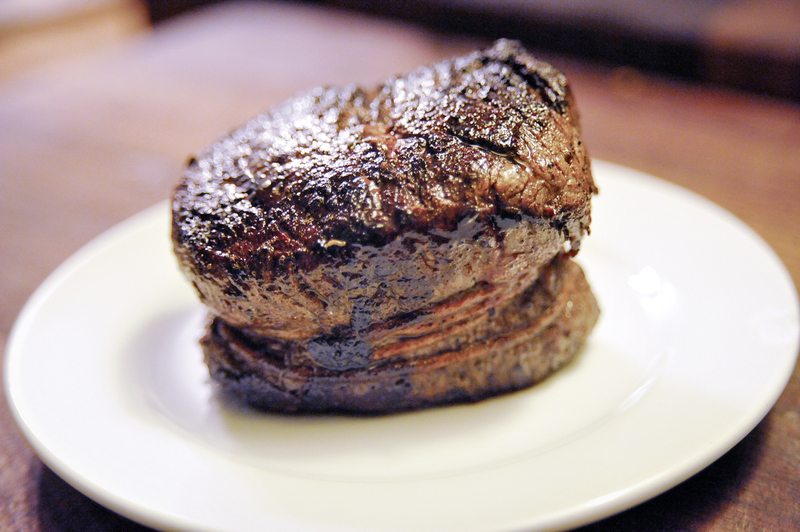 Note: Filet should be cooked to medium rare with an internal temperature of 135 degrees. Anything more will be a mistake and a travesty. Enjoy! I started this dish the other night, with a lot of expectation as I do most of my dishes and dinners for the most part (yes this is my dinner). It was well after 1 AM, and I was pretty exhausted by then, but the urge to cook something up for my self was too intense and so well, I got to cooking, or roasting and boiling some red bliss. 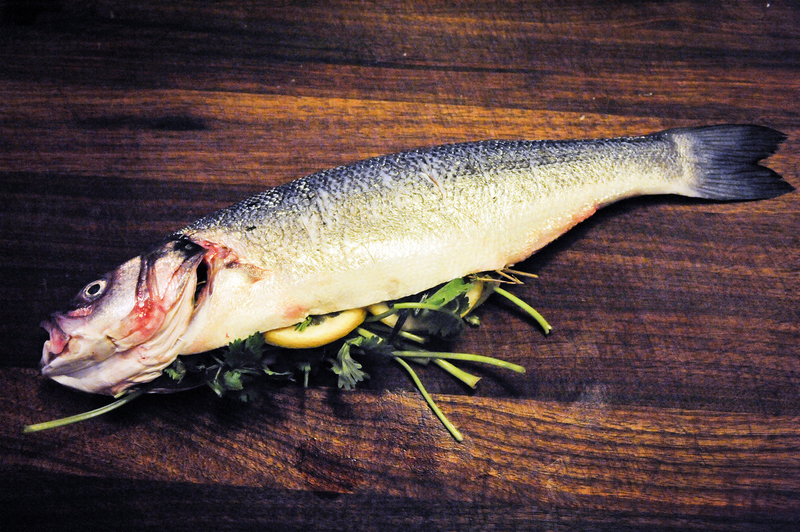 The branzino for all intents and purposes was absolutely brilliant. Not because I had really a whole lot to do with it, but because it is just such an easy fish to roast and well, if you do it right and follow some simple tips, you just can’t mess it up. 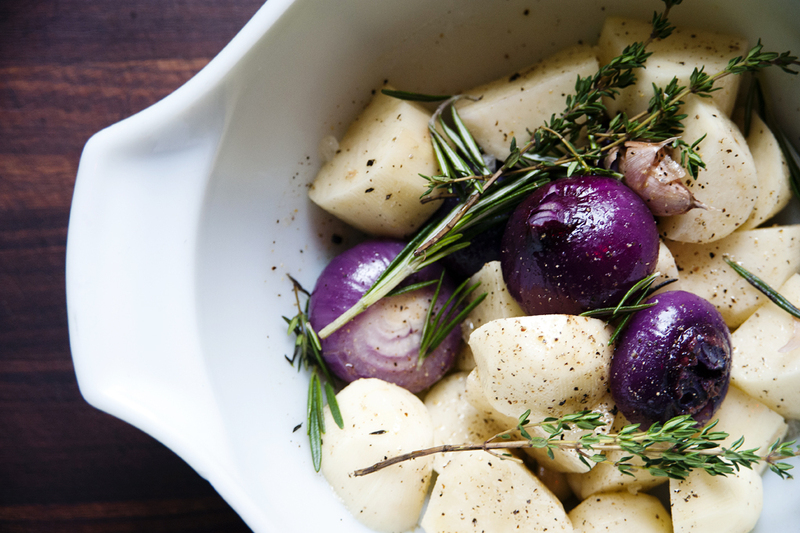 The potatoes are also an easy way to add a side to an already delicious meal be it by it self. They’re boiled till tender and cooked through but not overly cooked. Tossed in some Greek olive oil and finished with lots of freshly ground black pepper and kosher salt and Moldan’s sea salt for some added crunch. Preheat your oven to 400 degrees. 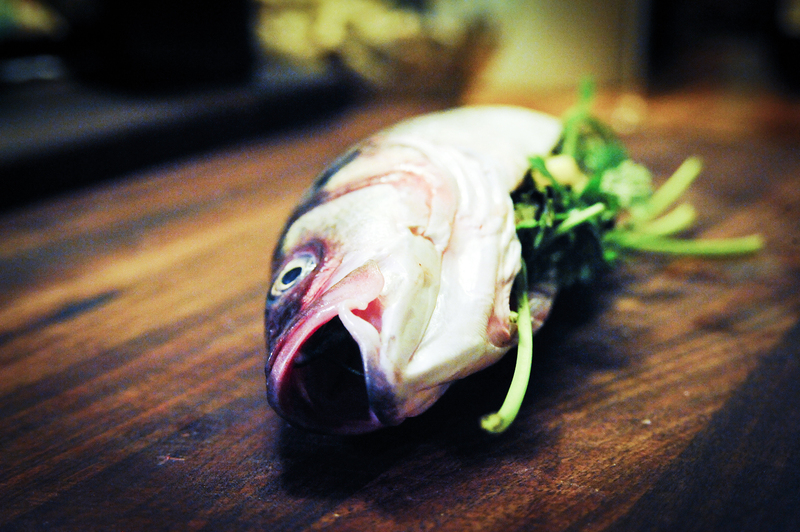 Be sure that your fish is clean and tempered at room temperature before cooking. Also, be sure to pat the fish dry with plenty of clean paper towel before seasoning. At this point in the recipe, I also hope that you or your fish monger has cleaned and scaled your fish (for you!). In a 13 x 9 inch sheet tray, spray with cooking spray, or coat by brushing with olive oil, with a pastry brush. You can also use a aluminum foil to cover the tray and make cleaning easier. Remember to spray or brush with oil too. Make 4 or 5, 2 inch slits using a chef knife or boning knife, 2 inches apart, on both sides of the fish. Place some Moldan (sea salt) or kosher salt into each slit. Into the cavity of the fish (belly), which should be cleaned and rinsed by your fish monger, season with salt and pepper and place the lemon and fresh herbs. To the outside of the fish, sprinkle generously with salt and pepper, and drizzle with plenty of olive oil to coat. 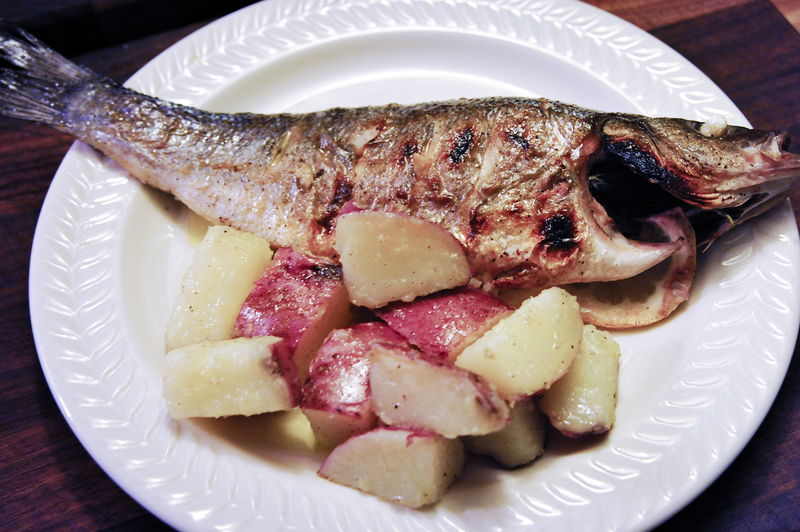 Place your fish into your preheated oven to roast for 6 minutes. Do not turn or play with the fish during this time or you will tear the skin. It’s important to be careful while turning the fish with a fish spatula (fish slice), during this point. Once flipped cook for an additional 5-6 minutes. 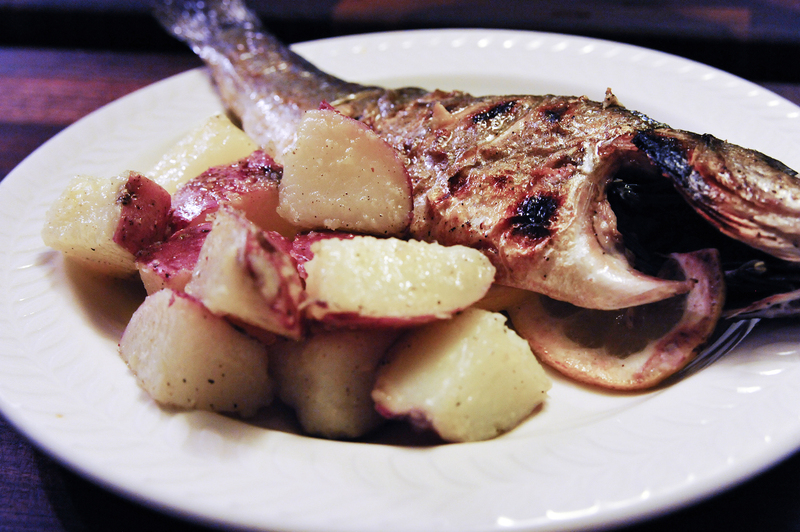 Once cooked, place the fish into the broiler to blister the skin and caramelize the outside. You can blister both sides as I prefer to do, but it can be tricky turning the fish. With much patience and practice you will get the hang of it. Enjoy! This recipe came about purely by instinct and I’m sure some other influence along my culinary trail. However it did come to be, it came along at just the right time, earlier yesterday, and not today. As I look up at the clock and realize that a new day has begun. My how time flies! So while working on the computer today researching job options and possibilities, I thought or remembered that I had: one, not eaten anything for lunch, and two, was well over what should be considered a plausible or reasonable lunch hour. So figuring out that much, I had to now conjure up something to eat and that would not take too long to prepare. But knowing me and knowing all too well how much I love well prepared food and also, knowing that I love to chef out when I can, it wasn’t long before I figured out what was available in the cold box and what I can do with those ingredients. So without further delay in my thinking process, I discovered that I had 3 different kinds of cheeses that had not been used and also, found a box of elbow macaroni. So to work I went on making this amazing recipe. Oh! did I mention that I also had bacon in the freezer?! I left that part out. Oops! Lo and behold, that dude (me), went right to work on this dish and it was so worth the effort and time it took to grate all three cheeses. Vermont white sharp cheddar, Pecorino Romano and lastly, some Fontina cheese. 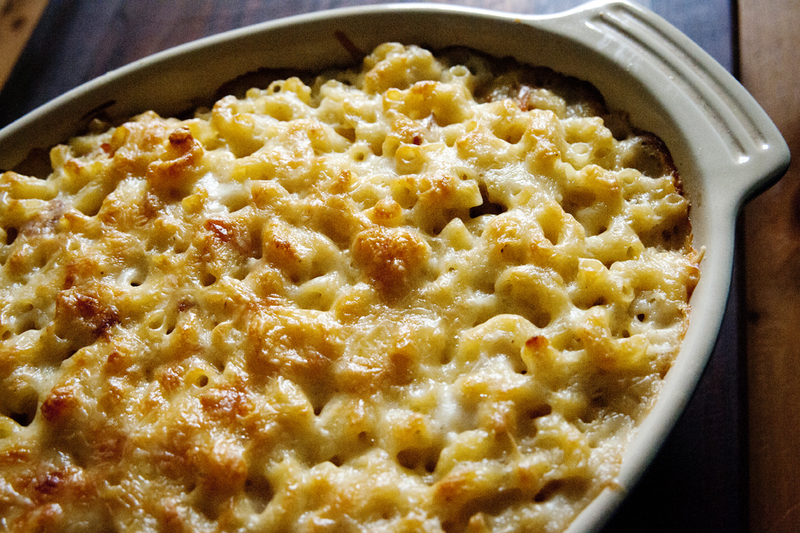 They were the perfect triumvirate, for this warm baked gooey macaroni dish. Have it with fried chicken, southern style with a crispy crust double fried. You won’t be disappointed I promise you. To begin, prepare your mis en place, by chopping the bacon into small pieces. I usually freeze my bacon, and cut the bacon crosswise into strips and then cut again into 1/2 inch pieces. (Bacon is layered so once the bacon hits the hot pan, the pieces or strips will start to separate). Once that is done set aside. Bring a large 3 or 4 quart pot of water to a boil with 1 tbs of salt. Add the pasta and cook till aldente. To a 2 or 3 quart sauce pot or dutch oven, add the milk, thyme sprigs and crushed garlic cloves and bring to a simmer. (With the side of a chef knife crush the garlic cloves, leaving the garlic skin on). Add 1/2 tsp of kosher salt and a few twist of fresh cracked pepper and the freshly grated nutmeg. In a separate pot or large sautée pan add the bacon with 1 tbs olive oil and sautée till the bacon is cooked and all the pieces have separated and browned slightly. Do not crisp! Add the butter and allow to melt, but not brown. Add the flour and whisk to combine and allow the flour to cook out. At this stage you are making a roux. A roux is equal parts butter and flour by measure that are cooked together and used to thicken sauces. Do not brown! A slight golden color is good (blond stage) as this is flavor, but you don’t want a brown roux. Once the roux is cooked, add the hot milk by straining it through a fine mesh sieve. Whisk the milk and roux to combine and make homogenous. You are making a bechemel at this stage. The bechemel should be smooth and creamy and should not be clumpy. Whisk till the milk and roux come together and starts to thicken. Do not let get too thick. It should be able to coat the back of a spoon, “nappe”, (pronounced nappay) but slightly thicker. If the bechemel gets too thick, add a bit more milk to loosen. Once the bechemel has come together and is completed, add the 3 grated cheeses and combine by whisking in with a whisk or a rubber spatula. By adding the cheese to the bechemel you are making a “mornay” sauce. I know it’s a lot to take in, but so worth it knowing each step and process. Once the pasta has cooked, strain and add the hot pasta to the sauce and toss the ingredients together to combine well. At this stage season with kosher salt and pepper and a bit more nutmeg to taste. Pour the mixture into a gratin or baking dish of your choice. I used a le creuset oval 2 quart gratin dish, but a square 10″ x 10″x 2″ square baking dish will work. Grate a bit more cheese of your choice, and cover the top of the mac and cheese with it, before placing into the oven to bake. This will create a lovely gratin top. I topped mine with Vermont white cheddar. Bake at 350 degrees, till the top forms a light brown crust. About 20-30 minutes. 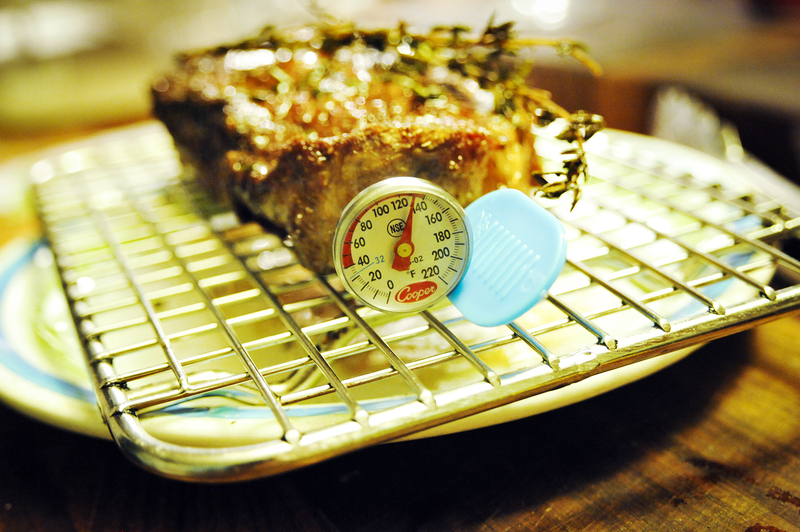 Oven temperatures can vary, so keep an eye on it. Enjoy! So the other day, I was asked by my client to cook him up a few dishes for the week, but in order to do that, I needed to make some room in the freezer. So while I was tossing food out that had been sitting in the freezer, I came across this perfectly fine veal chop. 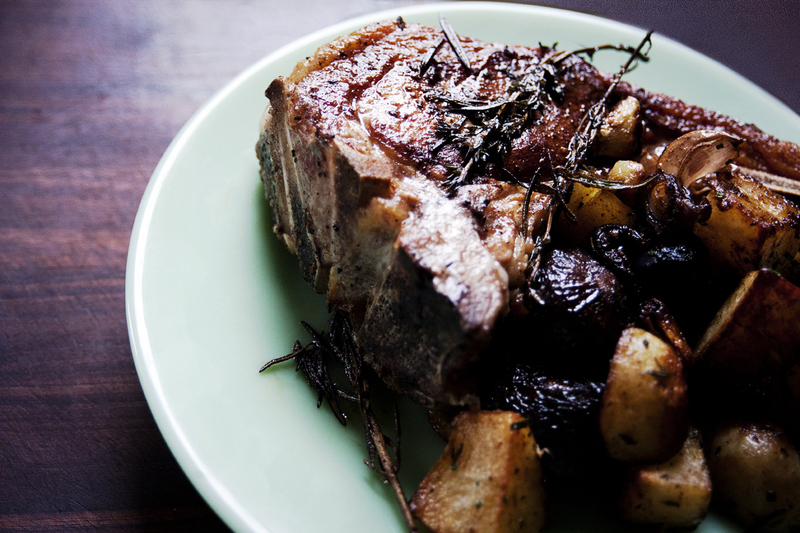 I recall shopping for this veal chop sometime during the summer; possibly August. In the end, I didn’t toss this veal chop, but instead, decided to take it home and check it out and possibly make it. It was kept in a zip lock back and was definitely frozen and also had some ice crystals on it, but for all intents and purposes seemed fine. But in the end, after thawing it out, it was the perfect chop and I was glad that it didn’t make the trash bin and instead made it to my kitchen for testing (devouring). The moral of most food stories or the old adage is, “When in doubt throw it out”! In this case I’m glad I didn’t. This chop was a perfect 2 inches thick. I rinsed and patted this chop dry with paper towel, and allowed it to dry in a cold fridge, almost like you would a cold dry age, but I didn’t use any cheese cloth soaked in salted water. It just worked. But of course, it was only kept in this state for 2 days and I wouldn’t recommend it for longer periods than that. Okay end of that. 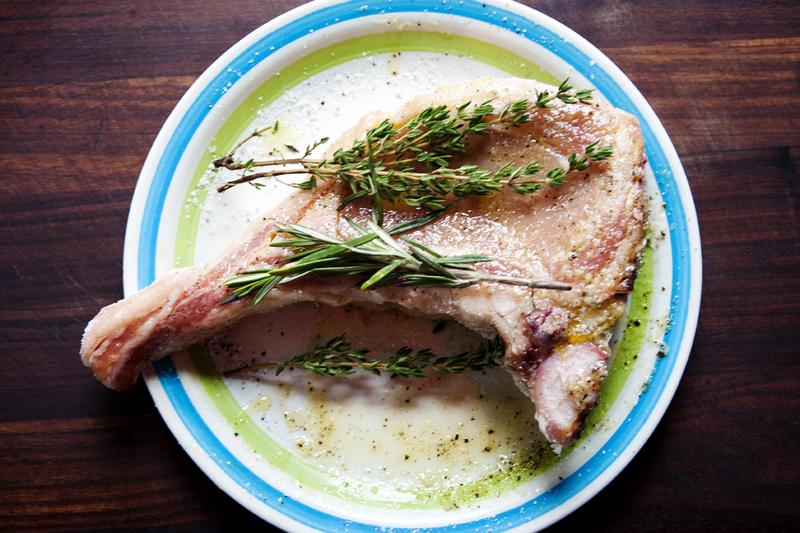 If chops are bought fresh from a reputable butcher and or market, then there is no need to rinse them. If however, you are not sure of the source of the chops, then on the other hand, a good rinse is always a good idea. And if so, pat them dry thoroughly before applying any seasoning to them. Place them on a dry plate and season both sides with plenty of kosher salt and freshly cracked black pepper. 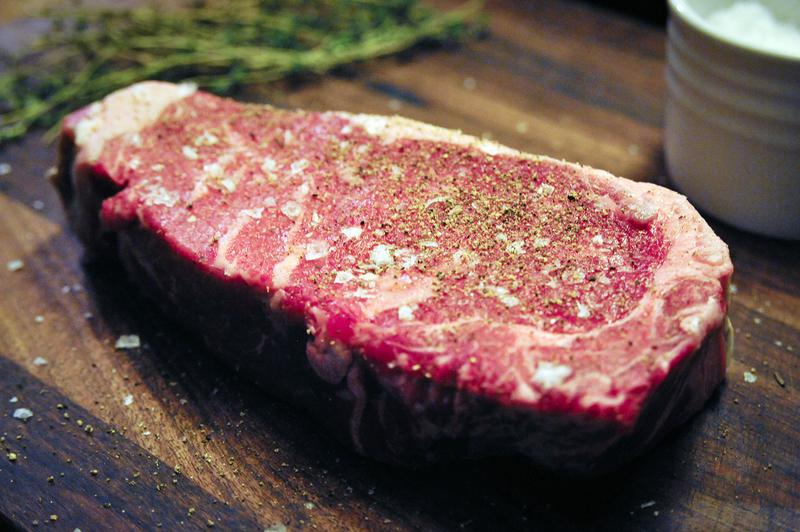 Drizzle with extra virgin olive oil, and rub the flesh with freshly smashed garlic cloves. (I don’t always do the last step, but it adds a great fresh flavor). 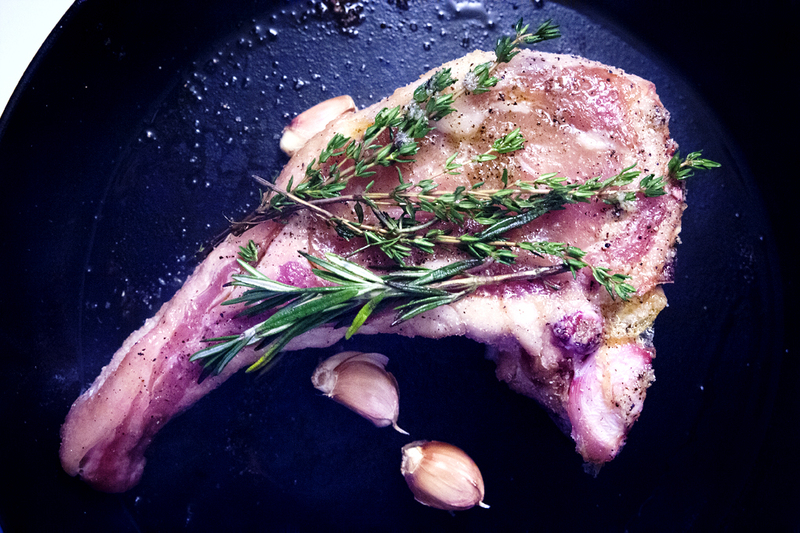 Place rosemary and thyme or your favorite herb on top of the chop and heat your pan. 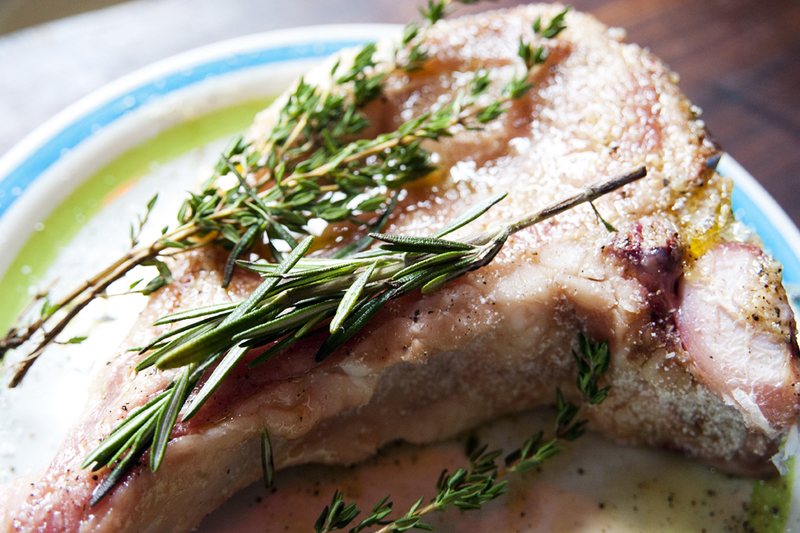 I don’t season my chops (veal), until I am ready to cook them up. If you season too early the salt will draw out the moisture and dry them up. Lets face it, we want to maximize flavor. 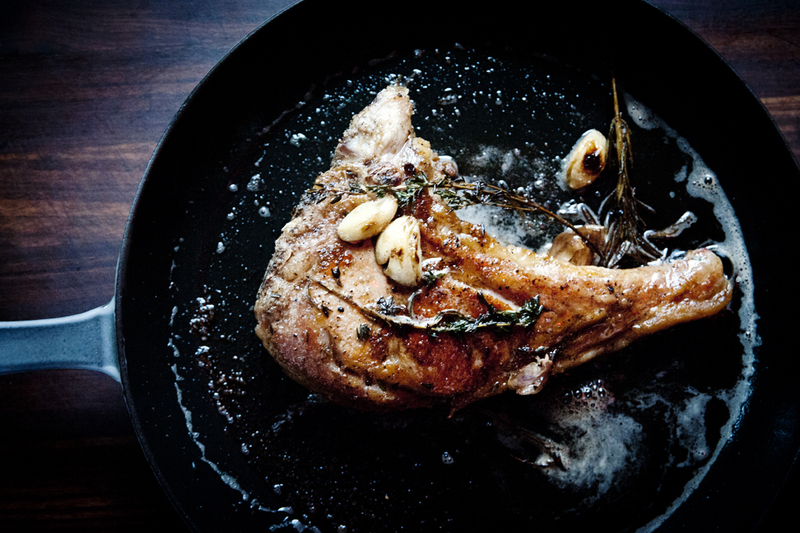 Once the pan has come up to temperature, pour about a table spoon of olive oil to your pan and then add your chop. Do not move them around or play with the food. You want a good sear and the only way to do that is to leave the chop alone and allow the crust to develop. After 3-4 minutes turn the chop over and place the herbs on the bottom of the pan and add the butter. Once the butter has melted, baste the chop using a large table spoon by tilting slightly toward you, to coat the chop thoroughly with the butter and oil. Place the pan into a very hot oven at a preset temp of 400 degrees, for an additional 6-8 minutes till done. Serve with your favorite sides, like roasted potatoes or rice pilaf or even a great salad. I couldn’t help post this series of images, before I truly had a chance to sit and give you the full story and details of my new favorite potatoes. What makes them so special is, the fact that they are sautéed with the gorgeous and sweet red cipollini onions. I have tried potatoes many different ways, as I am sure most of you have too, but when I tell you that this recipe rocks your savory taste buds in a new and exciting way, trust me, it’s not smoke and mirrors. I found my self a few weeks back at the Union Square Farmers Market, and I bought a few of these little gems, but never got the chance to use them in anything. Well, I’m glad I waited and happy that I got the chance to use these guys up in such a small but creative way. 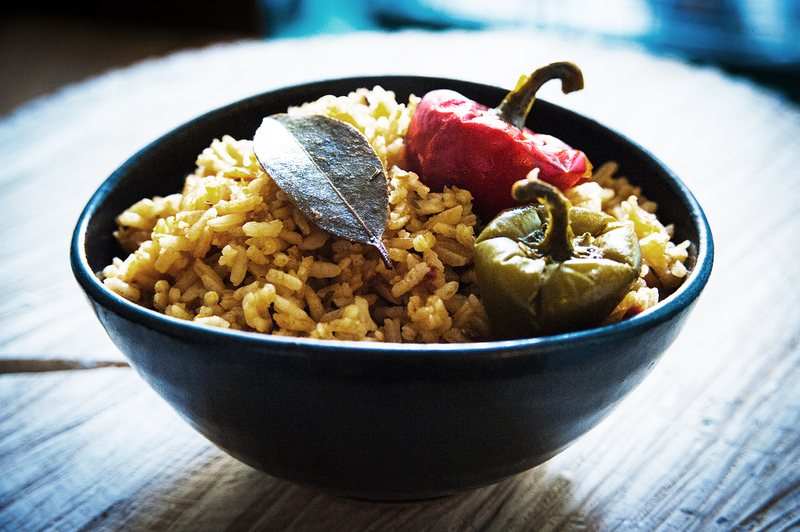 It’s one of those moments where you’re looking for something to make and want to jazz up a tried-and-true dish to make it a tad more special, but aren’t sure what to do to reach that end. Well, these onions did just the trick and I knew they would. Peel and cut into 2 inch pieces the russet potatoes. Set aside. Blanch the cipollini onions in boiling water for 3-4 minutes to losen their paper. Peel the paper from the cipollini onions, with a paring knife or your chefs knife. Cut the root end and the tops to make removing the paper easier. 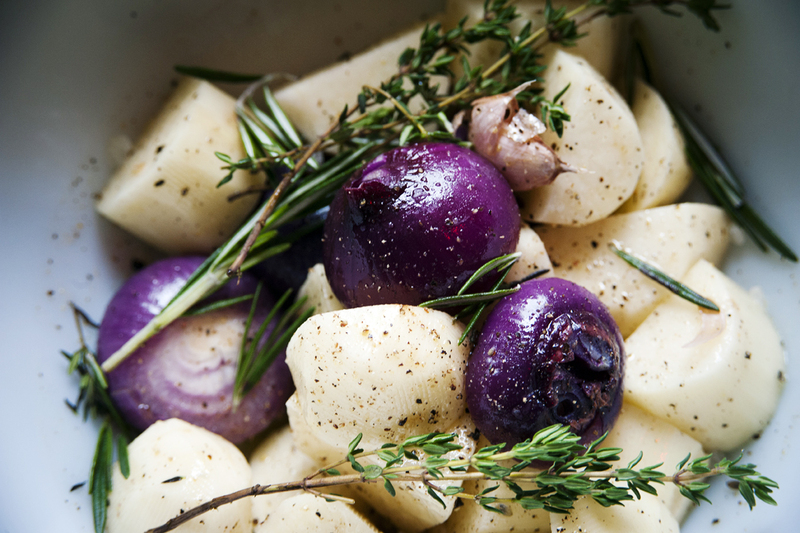 Add the potatoes and onions to a large bowl and drizzle generously with the olive oil, fresh cracked pepper, kosher salt and peperoncino. Crush a few garlic cloves with the back of your chef knife or the palm of your hand, and add to the bowl. You can leave the paper or skins on the garlic. I do! Adds flavor and a great look to the dish. Very chefy thing to do. Toss the ingredients to coat well with the olive oil and the other spices. Sprinkle some additional salt and fresh cracked pepper. Heat a large oven proof skillet or black cast iron fry pan. I use a 10″ Lodge fry pan, that is to me at least, an indespensible tool in my kitchen. They are the perfect skillet for making just about anything from roasted potatoes, frittatas, tarte tatin’s and even a perfectly roasted chicken. I just recently purchased a 12 inch Staub fry pan in graphite, that I am in love with. Either of these two pans work great for this application. A stainless steel fry pan works just as well. Some I would recommend are made by either All Clad, or Calphalon, as these too are oven proof. I digress! 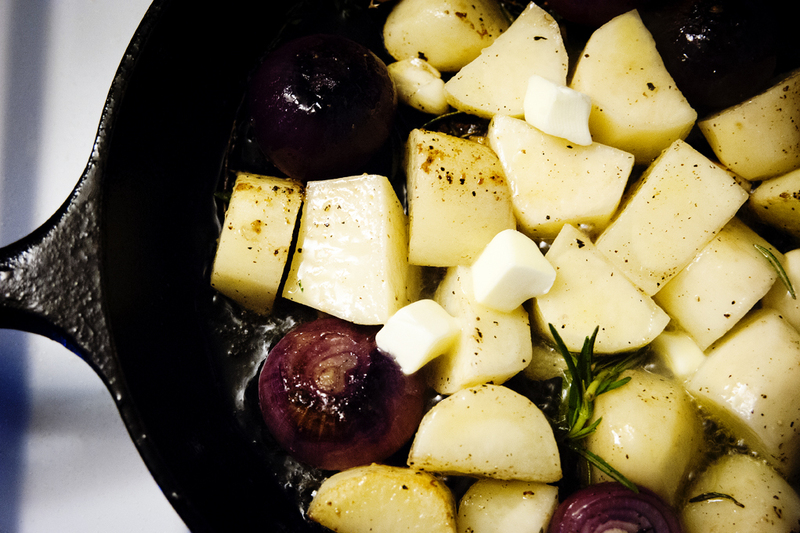 Once the oil has come to temperature, toss the potatoes and onions into the pan and spread the ingredients out so that the make contact with the bottom of the pan. 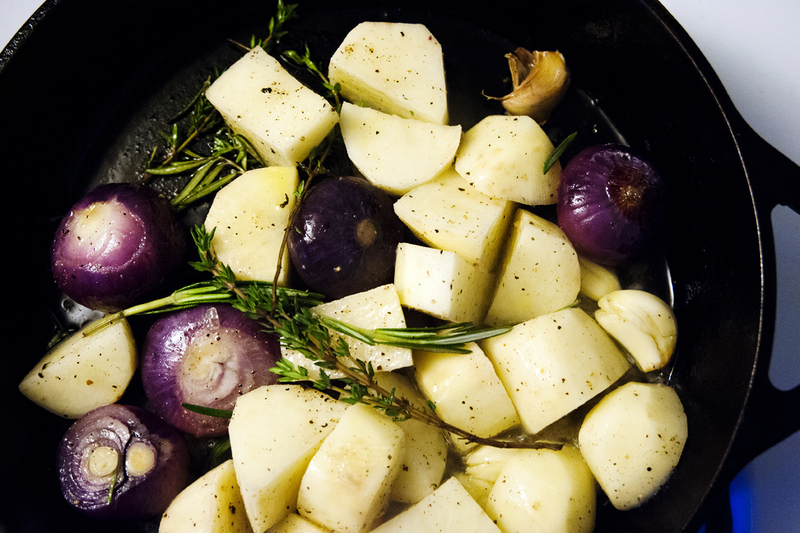 You are looking to get good color on the potatoes and onions (caramelization). Keep moving the potatoes if they are getting too dark on either side. Once you are satisfied they the potatoes have reached a medium golden brown color, add in the 2 tbs of butter and allow to melt. 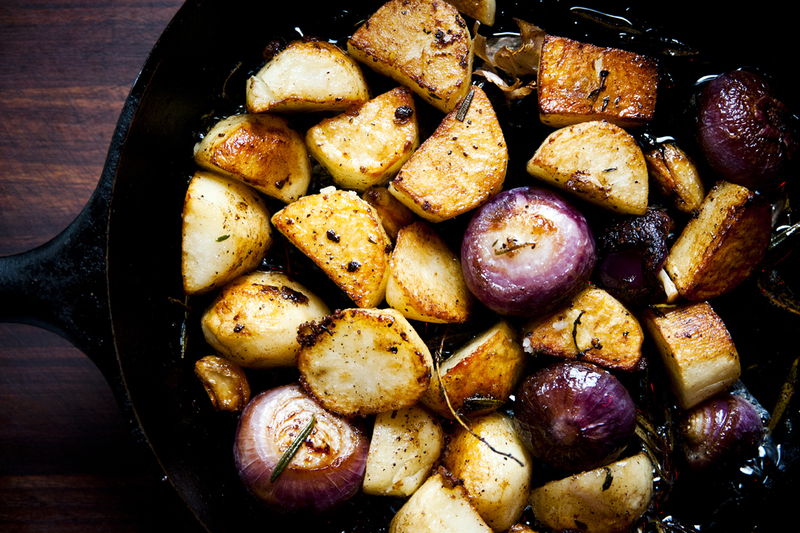 Toss the potatoes and onions to coat with the butter. Place the skillet or fry pan into the oven at a temperature of 400 degrees. 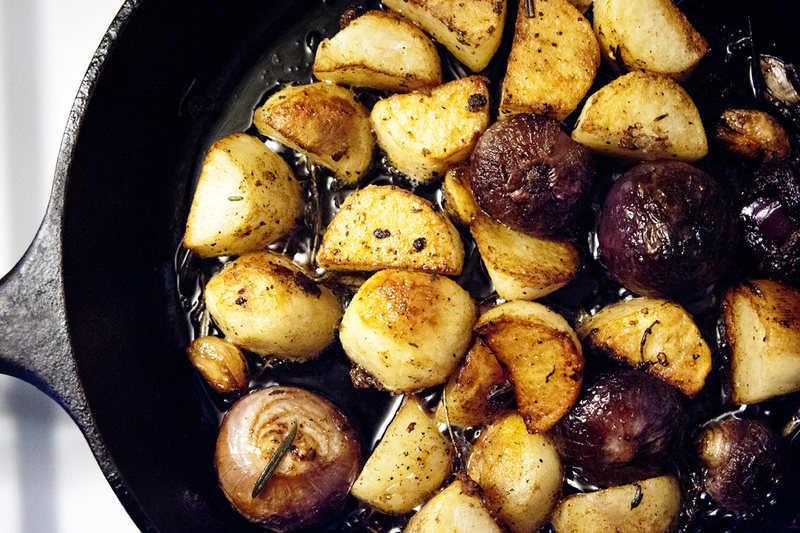 Roast the potato and onions till cooked through and crispy and golden brown. Serve immediately and sprinkle lightly with a good finishing salt like Maldon’s sea salt and the chopped chives or parsley. Enjoy these with a good steak or roast chicken.